The Corail Hotel Marrakech, about 2km from the Ben Youssef Madrasa, is made up of 50 comfortable rooms. For this purpose, the rooms have personalised climate control, a safe specially designed for laptops, Wi-Fi connection, minibar and satellite TV. In the restaurant, breakfast is served every morning in buffet style and the best dishes of Moroccan and international cuisine in the other meals. In the bar, on the other hand, you can enjoy drinks and snacks in a practical terrace. In addition, the hotel has many services such as, a 24-hour reception, medical service, a shopping service, faxes, currency exchange, a cloakroom or parking. Also, smokers have their own area. Guests can also relax in an indoor pool, in a tea room or diving or canoeing in the blue waters of the Mediterranean, or practicing basketball and mini golf. There is also a shuttle service to the airport, for greater customer convenience. Finally, different types of events can be held in the meeting rooms. Corail Hotel Marrakech is located about 6km from two of Marrakech's most treasured architectural jewels: La Palmeraie and the Bahia Palace. From the hotel’s doorstep you can also walk to the heart of the Medina, the Jamaa el Fna square. The Koutoubia mosque and the Dar el Bacha and Badi Palaces are other attractions of the city. The sacred tombs of the sultans, known as Saadian Tombs, are located next to the Royal Palace. As for museums, the Dar Cherifa, the modern Ministry of Taste, the Dar Si Said and the Marrakech one stand out. The Marrakech international airport is about 4km from the property. The guestrooms have a maximum capacity of three people. They have their own bathroom (with bath and towels), TV with international channels, Internet connection, air conditioning, minibar and safe. 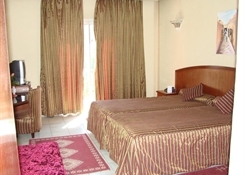 The rooms are categorised as double, twin and triple rooms. 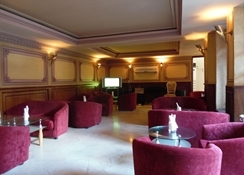 Corail Hotel Marrakech has a restaurant, bar and tea room. Breakfasts are served in buffet style. The restaurant serves a variety of cuisines both local and international. The hotel offers in room service. There’s private car parking offered by the hotel. Multiple entertainment programs are also offered (diving, canoeing, archery or volleyball). In the reception, there’s a doctor present at all times. There are also onsite shops selling souvenirs and other trinkets. 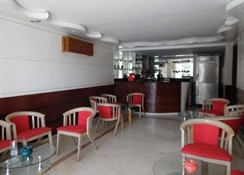 The reception also offers currency exchange as well as other business facilities. The hotel also offers an indoor pool. Excellent value for money friendly staff clean hotel near the town centre and places/ sights to see.